In the example below, chords are split over two voices by musicxml2ly, as it found them (as harmonies) in the MusicXML file. 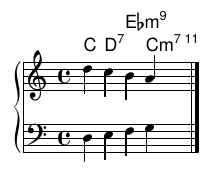 Would it be better to have only one chords part in such a case, to have Ebm9 at the same horizontal level as the other three chords, as MuseScore does in the second image? diagrams above each of the two staves." d4 c4 b4 a4 \bar "|." s4 s4 es4:m9 s4 \bar "|." \clef "bass" \key c \major \time 4/4 d4 e4 f4 g4 \bar "|." c4:5 d4:7 s4 c4:m7.11 \bar "|."